You will be attacking alot in this game. Whether it is for Strongholds, Skirmishes or attacking other Castles for resources. To do all of this, you need heroes! Better heroes = better strongholds and better skirmish targets. In this guide I will be covering the basics and also perhaps some advanced stuff about Heroes in this game. There are currently 4 ways to get Heroes. Free recruits: All Green and Blue Heroes. Premium recruits: All Green, Blue and Purple Heroes with the exception of The Ripper, Dragoon, Lady Eclipse and Sawarmor. Straight up buying a package from the store and you will receive a Hero as goodies! There are only 2 Heroes that are only available from purchase at the moment. In this game theres a currency named Souls. They are obtainable via events, pack store or by exchanging items with souls. There are 2 Events that offers a Hero Pack/ Hero Relics for certain Heroes when you get enough points and are ranked in those events. Check them out to see how much points you need and what you need to do to gain these points! Heroes obtainable : Warlord and the Ripper (Call to Arms event). Stormhammer and Sawarmor (Blood and Steel event). Alright. Now that we've got our Heroes. Lets get to know who they are, what they do and how to strengthen them. In this section, I will cover each tab in the hero menu. - Troops limit. The amount of troops your hero can command.The amount of troops displayed is not the number of reinforcement that you have Higher level troops requires more reinforcement to be converted to troops. For example, you need 27 reinforcements to convert them to 100 lvl 2 Knight unit but you need 61 reinforcements to convert them to 100 lvl 4 Knights. - Race. Some hero skills boosts only certain types of races. They are only a few heroes with racial skill but it helps to know whether or not your heroes have synergy with each other. - Army type. Your hero army details. 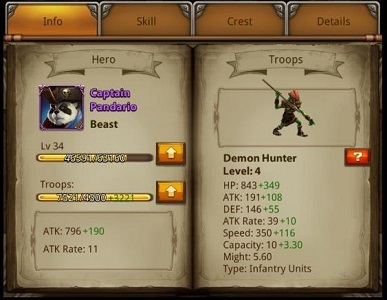 Here you can see what kind of troops and units your hero commands. I will cover about this more in another section. - Talents. Talents are unlocked for your heroes as your troop building levels increase. These talents almost specifically boosts your troops. From these talents, you can see where your troops will be positioned when in battle. When these talents are unlocked, you can increase the levels of your talents with ores up to level 20. New talents are unlocked when your troop buildings are at level 7, 13 and 19. 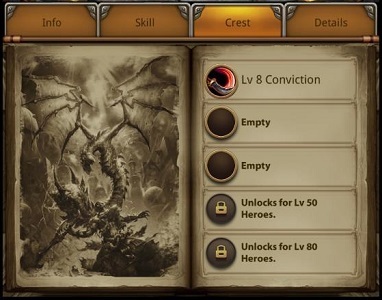 Increase both of your hero skills and talents to greatly boost your hero's might! You can inlay up to 5 Crests for each heroes. Just like your passive hero skills, you will unlock more slots to inlay crests to you heroes as you level them up. These crests helps you to either boost your hero or your army's strength! There are also unique crests that increase your %of prisoners captured or crests that gives two buffs! Slots for the crests are unlocked at 20, 30, 50 and 80. How to obtain these Crests? - You can obtain them by sacrificing prisoners at the dragon altar. Prisoners are obtainable by attacking people at skirmishes or defending you guild members from skirmish attacks. - Dragon mall. Exchange souls with the crests! There are 2 Crests currently available in the dragon mall. - Events. Getting in certain rank in the events will help you gain crests. Each Crest can be leveled up to level 25 by using either an enhancer, enhance all or max enhancer. Using enhancer or enhance all has a percentage to fail. Failing to upgrade your crest will result in a decrease of level. - Dont hesitate to use a new crest on your strongest hero! You can level them up and replace them later with a more suitable crest for your hero! The levels will stay the same! - Dont save up prisoners! Use them daily! 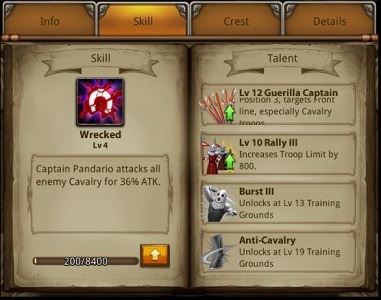 - Crests that increase troops level can only increase them by 1 even at level 20! Avoid leveling these crests and focus on others. - Check the troop information and see what kind of crest inlayed on your max leveled hero to see what kind of crest is suitable for that said hero! States where you can obtain said hero. Also tells you the specialty of the hero in the description. Every Hero in the game leads different kinds of Troops. There are 4 main type of Troops in the game. They are Infantry, Cavalry, Siege and Flying. These troops can be leveled up by upgrading your respective troops's building or inlaying certain hero crest to your hero. Each type of Troops consist of 4 kinds of Units. Im going to list from tank to attacker going with 1 being the pure tank unit. 1 - Barbarian - Infantry class unit. 2 - Shaman - Defense class unit. 3 - Demon Hunter - Guerilla class unit. 4 - Sniper - Hunter class unit. 4 - Bow Rider - Ballista class unit. 2 - Dwarf Plane - Sky class unit. There are 12 troops position in the game. Each unit occupies a specific position. For example Barbarian is always in position 2 and Demon Hunter in position 3. *UNCERTAIN AND UNCONFIRMED* : Every position is strong or weak against another position unit. Position 3 (Demon Hunters) are counter to all cavalry Unit. Position 2 (Barbarian) and Position 11 (Engineer) are weak against flying unit because they cant attack flying unit. 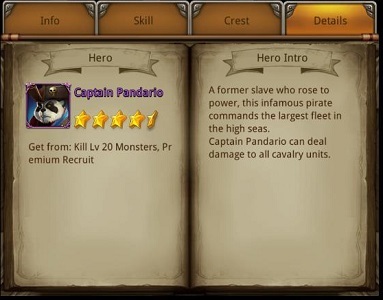 This is an example of Captain Pandario's unit. He is a Demon Hunter making him a Guerilla class unit. He is a captain because he is a purple grade hero and he is in position 3. - Updated troops based from the information of the new updates. - Some units cant hit flying units making them really effective to be use against them. - Stats of each troops depends on the grade and the rarity of the hero commanding them. Lady Eclipse for example has way more stats than Shadow hunter despite being the same grade and same type of unit. - ? means that type of unit is still not released yet. In the future when new heroes come, Im sure they will fill these question marks. Theres no best rule for a good composition but I would advice for you have a mixture from 1 to 4 while also having synergy between those heroes. Purple heroes may have better stats than green or blue heroes but if you fail in teambuilding, your team wont be at their maximum potential. Find a good synergy and balance between your team for maximum output! (1)Centaurion, (3)Captain Pandario, (3)Dragoon, (2)Skyterror, (2)Steelwheel. - Main tanks are Centaurion with secondary tank Steelwheel. Eventhough Skyterror is also a (2), he generally takes less damage because he is a flying unit and some units cant hit flying units. Centaurion gives hp boost to both him and the panda making them both tankier. - Main damage dealers are Cpt Panda, Dragoon and Skyterror. With Skyterror giving buffs to Dragoon. He will certainly hits hard both with hero and also troops. Will update this later. Server is currently down and I cant access certain information. I have moved it to the guide event section. Good Luck! This hero guide is more or less completed. If I miss anything about a hero please comment!